Facebook lit up with nostalgic comments when Eastern Mennonite University posted a photo of Martin House being torn down in August 2013. Hundreds of students had lived there since the 1960s, when EMU purchased the house. In the 1970s, Martin House was among several sites that became intentional communities for EMU students. Normally the communities were led by an older couple who lived in the house. In the case of Martin House, Loren and Pat Swartzentruber were early leaders. Loren is now EMU’s president. The 86-year-old house, on the corner of a busy intersection at the edge of campus, needed to give way to a future traffic roundabout and a formal entrance to EMU. The city of Harrisonburg is planning a solution to the awkward and dangerous intersection of Chicago Avenue, Park Road, and Mt. Clinton Pike. At the same time EMU asked an architectural firm to develop options for building a welcoming entrance for visitors who turn into Park Road. Lewis and Cora Martin built the house in 1927 when they moved from Maryland to the edge of campus to operate what was known for many years as Martin’s Store. It was located across Mt. Clinton Pike from them. EMU eventually acquired the store, turning it into a snack shop. Today the former store is part of EMU’s Center for Justice and Peacebuilding complex. For the last two years, the house stood empty, and its condition deteriorated further. “It’s amazing what happens when a building is not breathing,” said Eldon Kurtz, longtime physical plant director. The future traffic roundabout will take more space than a normal intersection, but it will be safer, more sustainable, and won’t need stop lights, say Harrisonburg city officials. Roundabouts are common in Europe and becoming more popular in the United States. But don’t look for the roundabout at Homecoming 2013 or even Homecoming 2014 or 2015. Such major changes occur on a long timeline, involving the coordination of the city, university and multiple other parties. 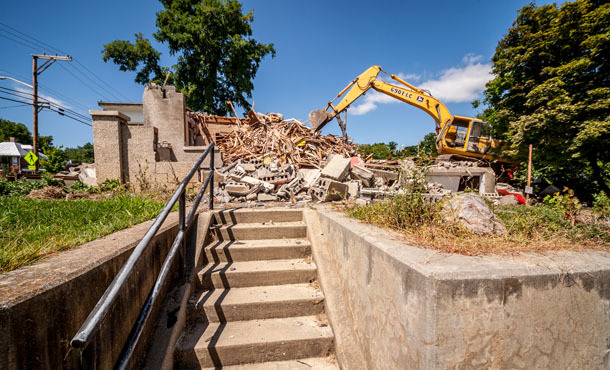 To make room, in addition to demolishing Martin House, EMU has already torn down Village House on the intersection and will demolish Redmond House as well as one of the Village apartments in the near future. The biggest drawback to the demolitions, according to Kurtz, is the loss of student housing options, especially for intentional communities. One solution circulating on campus is to transfer an academic department or two from houses to a three-story former residence hall named Roselawn. 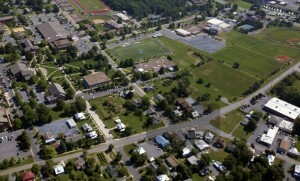 The departments’ houses would then be available for student housing. Another solution is for older EMU students to create intentional communities off-campus, as is already happening. In the meantime, EMU continues to purchase private homes that become available near campus. An entire residential block adjacent to the campus to the north, for example, is now owned by EMU, with the exception of two homes. Kurtz and others dream of a “sustainable neighborhood development” that would be a mix of renters and owners who are students, faculty, retirees, and others. The development would include common shared areas. “We need to continually assess all the spaces we have on campus so that we can use them more efficiently and sustainably,” said Kurtz. It won’t be long until EMU’s Facebook page lights up again with comments on new initiatives.